Robin Youngs, Edward Fisher,	The Journal of Laryngology & Otology, Volume 127 Issue 10, p 951. A Goyal, P P Singh, A Vashishth,	The Journal of Laryngology & Otology, Volume 127 Issue 10, pp 952-956. N Mills,	The Journal of Laryngology & Otology, Volume 127 Issue 10, pp 957-961. K Otsuka, Y Ogawa, T Inagaki, S Shimizu, U Konomi, T Kondo, M Suzuki,	The Journal of Laryngology & Otology, Volume 127 Issue 10, pp 962-967. P D Koors, L R Thacker, D H Coelho,	The Journal of Laryngology & Otology, Volume 127 Issue 10, pp 968-971. M Sagit, M Kavugudurmaz, S Guler, M A Somdas,	The Journal of Laryngology & Otology, Volume 127 Issue 10, pp 972-976. S Elwany, Y H Saeed, I Talaat,	The Journal of Laryngology & Otology, Volume 127 Issue 10, pp 977-981. L F Reynolds, M H Rigby, J Trites, R Hart, S M Taylor,	The Journal of Laryngology & Otology, Volume 127 Issue 10, pp 982-986. S Celebi, K Yelken, O N Develioglu, M Topak, O Celik, H D Ipek, M Kulekci,	The Journal of Laryngology & Otology, Volume 127 Issue 10, pp 987-990. Can head and neck cancer patients be discharged after three years? R Kumar, G Putnam, P Dyson, A K Robson,	The Journal of Laryngology & Otology, Volume 127 Issue 10, pp 991-996. 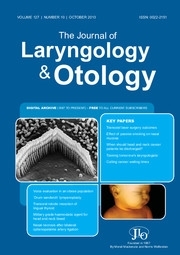 G Aynali, M Doğan, R Sütcü, Ö Yüksel, M Yariktaş, F Ünal, H Yasan, B Ceyhan, M Tüz,	The Journal of Laryngology & Otology, Volume 127 Issue 10, pp 997-1000. N De Zoysa, N Amin, M Harries,	The Journal of Laryngology & Otology, Volume 127 Issue 10, pp 1001-1006. G Dimbleby, L Golding, O Al Hamarneh, I Ahmad,	The Journal of Laryngology & Otology, Volume 127 Issue 10, pp 1007-1011. J C Fleming, Y Al-Radhi, A Kurian, D B Mitchell,	The Journal of Laryngology & Otology, Volume 127 Issue 10, pp 1012-1016. V Thirunavukarasu, T Carter, A Dezso, C Holland,	The Journal of Laryngology & Otology, Volume 127 Issue 10, pp 1017-1019. S N Bandyopadhyay, S Das, T K Majhi, G Bandyopadhyay, D Roy,	The Journal of Laryngology & Otology, Volume 127 Issue 10, pp 1020-1024. E Elsheikh, M W El-Anwar,	The Journal of Laryngology & Otology, Volume 127 Issue 10, pp 1025-1027. F R Datema, G M Bran, V C M Koot, P J F M Lohuis,	The Journal of Laryngology & Otology, Volume 127 Issue 10, pp 1028-1030. R Crunkhorn, R Burnham, G Walton,	The Journal of Laryngology & Otology, Volume 127 Issue 10, pp 1031-1033. E H C Teo, S-T Toh, H-N Tay, H-J Han,	The Journal of Laryngology & Otology, Volume 127 Issue 10, pp 1034-1037. A O'Connor, A Dias, C Timon,	The Journal of Laryngology & Otology, Volume 127 Issue 10, pp 1038-1039. S Kapoor,	The Journal of Laryngology & Otology, Volume 127 Issue 10, p 1040.